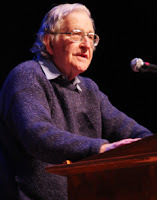 Pulitzer-Prize winning author Noam Chomsky denounced the Iraq War and "imperialistic" American foreign policy of the Nixon, Reagan and Bush administrations at Roxbury Community College last night. Chomsky, a renowned linguist often noted as one of the nation's leading leftist intellectuals, condemned Gens. David Petraeus and Ryan Crocker's abusive actions against the Iraqi state to the crowd of more than 500. "Lord Petraeus has initiated tyrannically destructive policies, including, but not limited to, the surge proposed on Sept. 11, 2007 in a despicably theatrical manner before Congress," Chomsky said. "Great sectarian violence, particularly in the Anbar Province, has all but consumed a once prosperous nation."